NEW! Epson Tm-L90 Direct Thermal Printer Monochrome Desktop Receipt Print 80 Mm. In excellent Condition! This printer is also used to connect Cash-drawer with RJ15 port. 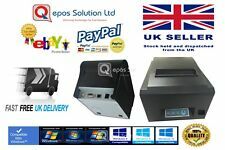 Qepos Solution Ltd. New QEPOS Thermal POS Receipt ECO Printer. New QEPOS Thermal USB / Serial port / RJ45 and RJ15 port - POS Receipt Printer. Ultra White In. The TSP100 Se. Cutter Life: 2000000 Cuts. Maximum Print Width: 72 mm (2.83"). Maximum Print Resolution: 203 dpi. Maximum Mono Print Speed: 250 mm/s. Technical Information. Power Source: Power Adapter. In addition, it has paper-saving options that can reduce paper usage by up to 30%. Product Family: TM. Product Type: Direct Thermal Printer. Form Factor: Desktop. Product Series: TM. Maximum Mono Print Speed: 200 mm/s. Product Type: Direct Thermal Printer. Form Factor: Desktop. Maximum Mono Print Speed: 300 mm/s. Maximum Label Width: 83 mm. Energy Star: Yes. Manufacturer Part Number: C31CA85835. Depth: 195.1 mm. Height: 148.1 mm. In addition, the TM-U220 printers have been designed to be 100% compatible with existing systems that currently use a TM-U200 printer. Buffer size: 4 KB. - 30% faster than the TM-U200 series. Ribbon life: 3 million characters. 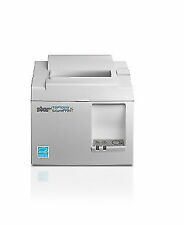 Star Micronics TUP900. Model TUP900 942-24. POS thermal printer. Printer only. Collection preferred. & Conditions. Aures ODP 333 Receipt printer. Model ODP 333. Interfaces: 1x USB 1 x RS232 Lan, 1 X Ethernet LAN. RS232 Serial - USB & Ethernet dual (non-modifiable). with Multiple Interface. Paper Auto cutter guillotine type Max. The item has only been removed from box or testing. The TM-U295 is also equipped with a host of user-friendly features, such as an easy-to-operate touch panel and an automatic paper eject function. Product Type: Dot Matrix Printer. Physical Characteristics. We have 2x Zebra ZM600 label printers (300DPI Quality) in very good condition. Series Information - Zebra ZM600. The printers are cleaned tested and include a. Building on the industry success of the TSP700 from Star Micronics, with a print speed of 48 receipts per minute (250mm/sec), the TSP700II is the best single station printer you can expect. The TSP700II now features a double resolution mode to increase sharpness to any graphic! Manufacturer: SafeScan. Model: TP-260. International Orders. Manufacturers part number C31C514057. TM-U220B SERIAL EDG. During that process you will be issued with an RMA number. In addition, the TM-U220D printer have been designed to be 100% compatible with existing systems that currently use a TM-U200 printer. Parallel Port: Yes. Print Color Capability: Colour. Colour: Dark Grey. Receipt printer, 8 dots/mm (203 dpi), variable paper width (58/80 mm), speed (max.). Print technology Thermal. Standard interfaces Serial,USB. Type POS printer. we do not take any responsibilty after this. PC Components. Weight 1.34 kg. Windows Embedded POSReady 2009. Windows Embedded Point of Service (WEPOS). SP298 Specifications. Star Micronics Dot Matrix Printer with Data and Power Cable. Rugged bi-directional printer for cut sheet, multi-copy forms. Autocutter Slip Printer. Resolution 7 x 9 half dot. High reliability with helix head drive and 9 million lines CRT. 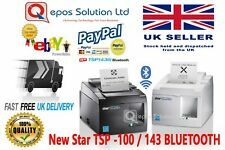 New Star BLUETOOTH Micronics TSP-143III-BI Thermal POS Receipt ECO Printer. 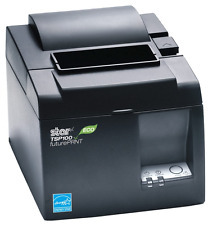 New Star Micronics TSP143III-BI Thermal USB POS Receipt iPhone, iPod, iPad ECO Printer. First BLUETOOTH Thermal POS printer to print directly from an iPad or iPhone. Interface Built-in USB interface another selection: serial RS-232C, parallel IEEE-1284, high-speed USB, powered USB, Ethernet 10/100Base-T/TX, or a Connect-It interface. Thermal Receipt Printer. TM-T88V Receipt Printer. TOSHIBA SAMSUNG TS-H492C BLACK BEZEL IDE DVD/CD RW DRIVE USED. © Solent Spares. 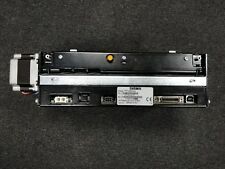 HITACHI LG SATA SUPER MULTI DVD REWRITER GH82N/C13H6. AMD OPTERON DUAL CORE 2216 2.4GHZ SOCKET F PROCESSOR OSA2216GAA6CX. Model: TM-T88V (M244A). Type of Printer: Thermal Printer. Interface Connection: USB RJ-45 Network Ethernet. USB Printer Cable. Receipt Printers. Kindly ask us for details. What is included Resolution: 203Dpi. Manufacturers part number C31C513057. During that process you will be issued with an RMA number. Bluetooth Wireless. Bluetooth support. NEW IN THE BOX! Paper-out sensor. 32 bit high-performance processor. Resident scalable fonts. 4 MB Flash, 8 MB RAM. WLAN Network Printer. 802.11b wireless local area network (WLAN). WIFI Connection. ZEBRA QL 320. Professional Direct Thermal Printer Direct Thermal Printer. 802.11b Wireless Local Area Network Printer. The TM-U295 is also equipped with a host of user-friendly features, such as an easy-to-operate touch panel and an automatic paper eject function. TM-U295 Slip Printer. Case Color Product Features. • Operator-friendly features. Four paper paths can handle forms, cut-sheet and continuous sheets. 9-pin print head for optimum performance and quality. In this case, the Supplier will inform you of any delay as soon as possible and will give you the option of cancelling your order at this point. Manufacturers part number C31C163292. During that process you will be issued with an RMA number. Ribbon Type Wax. In The Box 24 Printer Ribbons. Ink Colour Black. POS THERMAL PRINTER. Receipt / Ticket Printer. USB INTERFACE (Cable Included). Label Printers. STAR MICRONICS. Receipt Printers. We require cleared funds before we can dispatch your order. Original invoice.